The engine has various components and the engine weight will largely be dependent on the type of car. For a small car expect an engine weight of 150 kg/330 pounds while a large v8 diesel can weigh above 350kg/771 pounds. These weights are minus the transmission which can push the car engine weight to around 600 pounds. While most formula ones cars are extremely fast the engines used are lightweight and weigh 100 kg or 210 pounds. The Bugatti Veyron has an engine weight of 400kg while McLaren F1 weighs 266 kg. 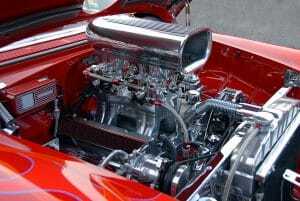 The Chevy small block engine weighs 575 pounds while a GM 2.0 liter weighs 300 pounds. People often modify their cars to reduce engine weight. They do this by removing non-essential electrical parts that could be putting additional weight on the car. This could include removing the air conditioning compressor. This saves you an extra 10 kg. Some will go to the extent of removing the car fan, heater matrix, and piping. You can also swap your existing battery for a lighter one once you have removed the air con and stereo. If you are turning your car into a racing car you will need to remove the rear seats which save you some 25 kg and ditching your spare wheel and jack. Electrical seats weigh around 35kg each and you can replace them with lighter ones. But, the largest part of car savings come when you replace the exterior parts with lighter ones. Most of the car parts like the bonnet, doors, front wings and roof are either made from aluminum. You can swap these with glass fibre plastic which is lighter. Glass windows can be replaced with polycarbonate which is lighter. The wheels can also be changed for lighter ones. Lighter wheels mean you have a reduction in rotational mass and this reduces pressure on the suspension. In the end, you will experience faster acceleration. You can see some considerable savings when you reduce the amount of fuel in the fuel tank. But, ensure that you have enough fuel to get you by. Many cars are nowadays fitted with carbon fibre bonnets. This looks great for the car but you will need to find one that is of good quality and complements that rest of the car parts. If you have removed the rear seats and replaced the windows for polycarbonate ones you next need to add a roll cage. This keeps your lightweight car rigid but at the same time keeps you safe. The roll cage will add some pounds to your car – which you are trying to remove – but it helps in handling the car also. In the extreme there those who attempt to reduce the car weight by drilling holes in the metal parts. However, this makes the car less rigid and increases the probability of it rolling. You can have extra weight savings by removing the door hinges and locks. Not all engine components are necessary to make the car move. The engine block itself is heavy and there are little modifications that can be done there. However, you can decide to drive without the benefit of the air con. The alternator, flywheel and water pumps add considerable weight to the engine but there are essential. You can replace the factory made alternator with a lightweight one and save a few pounds. It is generally agreed that the larger the engine the better the performance. Large engines are often fitted in high-performance cars and give you faster acceleration and top speed. But heavier engines also affect braking power, handling, and cornering. The more a car engine weighs the less effect it has on transitions and lane change. A large engine will require bigger springs to control the weight. This, in turn, makes the car heavier. The wheels also need to be changed to handle the extra weight and for good traction. Today instead of producing larger engines they have been adjusted to fit turbos which makes them more efficient. Manufacturers are producing smaller engines but are able to extract more horsepower from them. This means the overall weight of the car is kept low while performance is increased. According to research done by the US Department of Energy reducing the car weight will have a 1 to 2% reduction in car fuel for every 100 pounds. It requires more fuel to move a heavy car. If you want to reduce car weight look for lightweight components. If you have two cars – one small and heavier one – the small car will become faster for every 100 pounds of weight reduced. Removing cargo holders helps in the aerodynamics of the car. This will also reduce fuel consumption by up to 17%. The car engine weight varies but the average for most saloon cars is around 300 pounds. 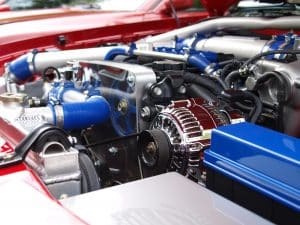 The engine block is connected to other parts to make it efficient like the water pump, transmission and electrical components which may increase the overall engine weight. Many car enthusiasts have realized that a lighter car is a fast car. By replacing the car windows with polycarbonate you save some pounds. In most racing cars some car luxury parts have been removed. This includes the air con, rear seats, spare tire, jack and lightweight alloy rims fitted. A lightweight car consumes less fuel. It is assumed that the larger the engine the better the performance but manufacturers are extracting more horsepower from small engines. You can also increase the engine performance by installing a turbocharger. The internal combustion engine works through the combustion of air/fuel mixture.